Croagh Patrick dominates the landscape for miles; from the N17 road that runs north to Sligo from Clare, its almost perfect cone can be seen from some 20 miles distant,and on a clear day it can be seen from some 40 miles away. 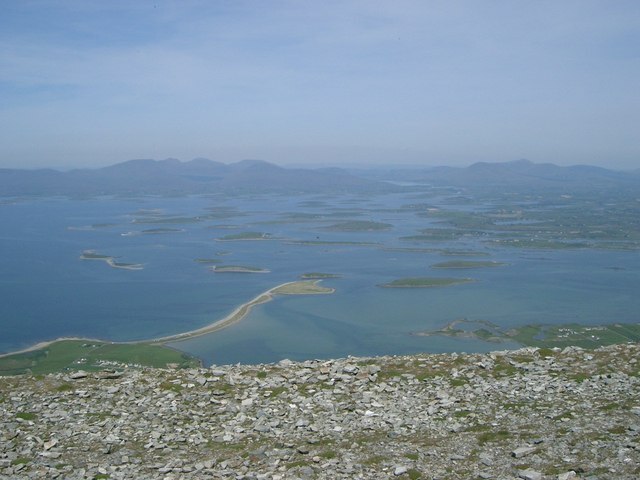 Anyone reaching the summit, whether tourist or pilgrim,is stunned by the magnificent views, most especially of Clew Bay with its more than 300 islands, lying some 2,500 feet below. It is believed that St Patrick used the mountain as a place of penance and that he fasted for 40 days and nights on the summit in the year 441 A.D. The pilgrimage as we know it today is a religious one, with Masses and Rosaries punctuating the entire day. Long before St Patrick’s arrival however, the mountain had been a sacred place. In the Celtic tradition, the Festival of Lughnasa (pronounced Loo -nasa) was celebrated on August 1st ( Lughnasa is also the Irish word for August). This was an annual festival honouring of the god Lugh (pronounced Loo) at harvest time. Across the country festivities took place, often on mountains such as Croagh Patrick. Lughnasa was the most important Fire Festival of the Celts and in common with many other pagan festivals and traditions it was Christianized and adopted by the church in a different guise. Croagh Patrick and the surrounding landscape has much archaeological evidence of the sacredness of this place, going back millenia. A rock, known locally as St Patrick’s Chair, has engravings that date as far back as the neolithic, thousands of years before Christ. Also in the area, remains of a hillfort have been discovered that dates from before 800 B.C. The local archaeological society recently discovered that, each year on April 18th and August 24th, the sun sets on the summit of Croagh Patrick, and then – rather than slipping behind the mountain – it seems to ‘roll’ down the steep slope. To see some ‘rolling sun’ images, click here. 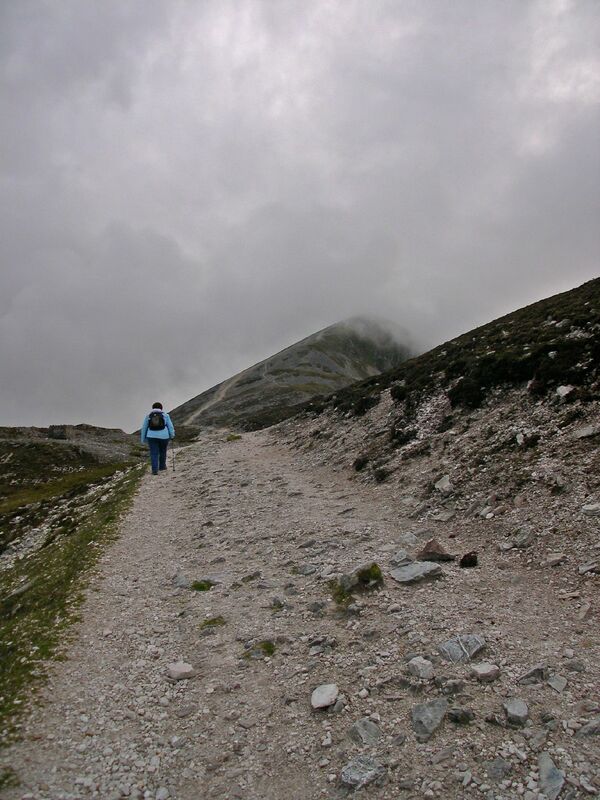 Croagh Patrick is a spectacular place whose appeal to ordinary humans has lasted thousands of years, and without doubt, will continue to do so for thousands of years to come. Portrait of Dr James Barry painted 1813 – 1816. Image: Wikipedia. In July 1865 a char woman named Sophia Bishop was asked to lay out the body of an eminent physician. The place was London and Doctor James Barry, who had attained the rank of Inspector General of Military Hospitals, the highest medical rank in the British Army, had died of dysentery. Sophia Bishop went about preparing the body and discovered that Dr. James Barry was in fact a ‘whole woman’ and had stretch marks on her body indicating that she had even borne a child. Sophia did not disclose the information until after the funeral. The story grabbed the headlines for a time, but there was no conclusive evidence as there had not been a post-mortem. Interestingly for someone of such a high military rank, and who had given 50 years of loyal and distinguished service, no obituary was ever published. Furthermore, the embarrassed British Military placed an embargo on Dr Barry’s military record for 100 years. Dr. James Barry was born Margaret Ann Bulkley in County Cork in the closing years of the 18th century. Her mother was the sister of James Barry a renowned artist and member of the Royal Academy in London, her father Jeremiah was a grocer. Margaret was a bright child who had expressed a wish to become a doctor, but at that time women were barred from medical school. 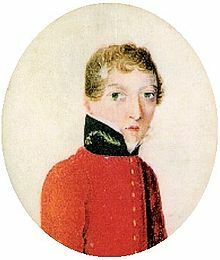 Margaret’s uncle James Barry had influential friends, one of whom was General Francisco de Miranda from Venezuela. Another friend, David Stuart Erskine, 11th Earl of Buchan, was an avid supporter of the education of women. It is thought that General Miranda and Erskine were part of a group that hatched up a plan for Margaret to enter medical school disguised as a man. After qualifying she would be free to go to Venezuela to practice as a female doctor. And so, James Miranda Stuart Barry entered the school of medicine at Edinburgh University in 1809 at the age of 14. The plan to go to Venezuela faltered when General Miranda was imprisoned by the Spanish, and ended with his death in prison in 1816. Dr James Barry at some stage decided to continue in a male role and joined the British Army medical corps. He was posted to the Cape of Good Hope where he befriended the Governor, Lord Charles Somerset (1767 – 1831). It is possible that Somerset was aware of Dr Barry’s true identity as he too was a friend of the Earl of Buchan. The Governor set Barry up in private apartments at his residence. Soon rumours began to circulate that Dr Barry and Lord Charles had an ‘unnaturally close’ relationship. The rumours of a homosexual liaison reached London and a royal commission was set up to investigate the scandal. Somerset returned to England and Barry was later exonerated. Dr Barry had a distinctive high-pitched voice, wore three-inch high inserts in his shoes to increase his height from 5 feet. He wore oversized clothing. He was known to be prickly and difficult and was fiercely defensive if accused of being effeminate or if his high-pitched voice was commented upon. He is known to have fought duels in defence of his honour, having been injured in one and reportedly shot an opponent at one time. 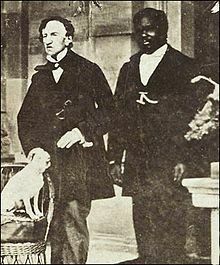 Professionally, Dr James Barry won great acclaim as a surgeon, entering the history books when he performed the first Caesarian section in Africa in which both mother and baby survived. The grateful parents named their child James Barry Munnik Hertzog in his honour. (JBM Hertzog later became Prime Minister of South Africa from 1924 – 1939). Dr Barry also protested against bad medical practice and the ineffective and often toxic medicines sold in pharmacies. He waged war against poor hygiene standards. His radical treatment for leprosy and tropical diseases transformed the hospitals in which these diseases were treated. In spite of insubordination and being court martialed, Dr Barry continued to rise up the army ranks. As Inspector-General of Military Hospitals he spent some months in the Crimea, studying the appalling hospital death rates in Florence Nightingale’s Scutari hospital. The ‘Lady of the Lamp’ described Barry as ”the most hardened creature I ever met throughout the Army”. It is believed however that this visit led to a radical reform of battlefield medicine. Forced to retire in 1864, Barry did not receive the customary knighthood that a person of such reputation would have been granted. His years of service in many parts of the Empire were peppered with arrests, demotion, insubordination and unannounced leave, that overshadowed his medical achievements. Margaret Ann Bulkley lies buried in Kensal Green cemetery in London. 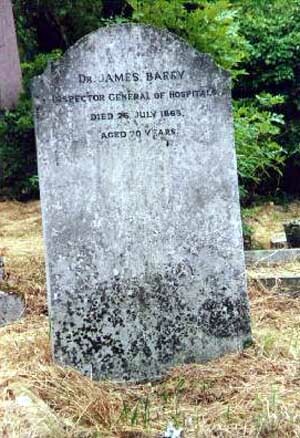 Her gravestone is marked : Dr James Barry Inspector General of Hospitals, Died 26 July 1865, Aged 70 years. She was an extraordinary doctor, the first female graduate from a medical school in Britain who fooled the British Army and the rest of the world for 50 years.